Susie has been battling problems with her left ear for the last couple of years. She recently developed yet another ear infection, with some a yellowish green discharge. We had a culture done and it turns out to be a fungal infection. Our ENT prescribed for her Cortrimazole 1% Solution, five drops, twice per day for a week. Sounds like no big deal. Well I showed up at the pharmacy and learned the prescription is “not covered” by our prescription drug plan, courtesy of CVS Caremark. 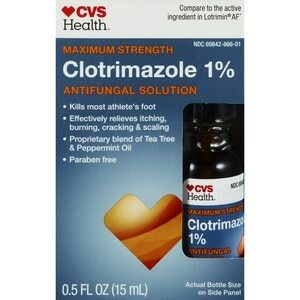 I talked to our pharmacist and she said there is no over the counter anti-fungal for the ear, but there is a similar solution available for external use with athletes foot and jock itch. I looked at the this version, and it also included additional oils and other ingredients that the prescribed version did not contain. So, I called CVS Caremark to find out why they did not cover the prescribed version. They were polite, but the short story is I need to get Susie’s ENT to fill out an appeal for them to review. I even talked to a pharmacist with CVS Caremark. She understood the problem, but explained the drug coverage is made by committee. I asked if she would feel comfortable putting the anti-fungal drops in her ear. Her response was if the doctor said it was okay. I then called Susie’s ENT and discussed the situation. He expressed frustration regarding the prescription drug companies pushing cost onto the consumer. While theoretically the foot fungus solution should be as effective as the prescribed version, he was not keen on the addition of “Proprietary blend of essential penetrating carrier oils” into the ear. He did mention the same solution might be available over the counter for dogs and cats. He does not submit prescription coverage appeals, as the prescription drug companies just reject them. So a solid morning of headaches for $65. No thanks to CVS Caremark pushing costs down to their members.